‘Hot’ and ‘cold’ leads are common terms within marketing. Have you ever thought about what they look like? Visualise your marketing as a colour spectrum, with blue on one side, and red on the other. New visitors to your site sit in the blue as cold leads. Your acquisition process aims to move them along to the red (or hot) end of the spectrum. Think of red as the ‘money’. Your aim is to keep subscribers (or customers) engaged with you, firmly in the red. You don’t want them drifting back to the cold blue. One way to keep them in the red is to use email segmentation. Last week, we talked about list segmentation as the equivalent of using premium ingredients if we compare email marketing to baking. But what is segmentation and why should you do it? We’ll cover the why before we move onto the how. Why Should You Use Segmentation? Sending a campaign to a segment, rather than your whole list, can see open rates that are 14.32% higher than ordinary emails. Why? Subscribers only receive content that’s relevant to them. It’s marketing that puts their needs before yours. If you send irrelevant emails, you risk them unsubscribing from your list (not that unsubscribing is a bad thing). Let’s say you run a hotel. You send a range of emails to your subscribers, made up of past and future guests. The content might include special offers for local tourist attractions. Or you might send recommendations for things to do. Perhaps you share stories about the history of the hotel. Without segmentation, all of your subscribers receive the same content. Past guests won’t care about a special offer for a nearby stately home. Future guests won’t be able to use loyalty discounts until they stay at the hotel. But you’re a smart cookie so you’ve segmented your list. Past guests get information about loyalty schemes. Guests who will stay with you within the next month receive suggestions and special offers. Guests with reservations over a month away get stories about the hotel to get them excited. No one gets content they can’t use. Your subscribers stay in the red on your customer spectrum. How Do You Segment Your Subscribers? The data you look for will depend on what you sell. Look at your marketing strategy to work out what you’ll be sending. Work backwards from there to identify what kind of customer wants that content. Enable the segmentation tools in your email marketing software of choice. Different providers might use different terms, such as tags, groups, or segments. Remember your subscribers can appear in a range of segments at once. You don’t have to keep them in one. (Note: Some email providers use static segmentation — you have to update and manage that yourself, a time consuming exercise!. 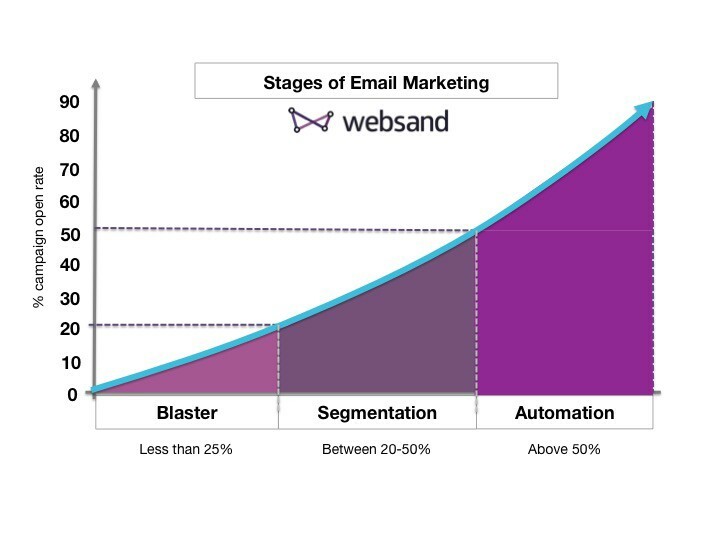 If you use Websand, the segmentation is dynamic, that way your audience is always segmented based on their behaviour – signup for a 14 day free trial here). You can gather the data you need to segment your subscribers in different ways. Use your subscriber forms to get the basics, but be aware customers don’t like to fill in a million boxes to get a download. Let subscribers self-segment by gathering data around how they engage with your emails. Tag them according to the links they click on. These clicks alert you to their interests. By creating emails tailored to these interests, your subscribers are more likely to open–and act on–them. You can even send surveys once they’ve moved along your subscriber spectrum. If you tell them you’ll use the data to send more relevant content, most subscribers are happy to answer a few questions. It’s unlikely you’ll build their entire segmentation profile in one go. You’ll have more luck building it up across a range of interactions. Set up triggers so that subscribers slot into new segments whenever they interact with your website or emails. So how do you actually segment your list? Let’s look at some segments you might want to use. What do you do if your company offers more than one service? Or what if you work in several industries? Use your website to segment subscribers. Link sign-up forms to your segments so subscribers only get relevant content. You can even segment your subscribers according to the industry they’re in. Consult your data about how customers use your website. We’ve talked about cart abandonment before. Now use that data to create a segment of hesitant buyers. Use triggered emails to soothe their worries and guide them towards a purchase. Get your users to enter their birthday as part of their profile on your site. Send them birthday greetings or send them special offers. Add their name to personalise the email and see a 6x higher transaction rate! Get your subscribers to enter their seniority at their company. You’ll know who to target for higher ranking business decisions. Is your business dependent on a specific location? Create a segment of subscribers for that location. Invite them to local events or send them different, more specific local content. Get your users to self-segment according to their skill level. Send subscribers tips or tricks appropriate to their ability. Skillshare send recommended courses based on the interests subscribers log when they sign up. The only problem with this option is getting your subscriber to move from one level to another. You don’t want them to feel your content is too ‘basic’ once you’ve passed on your knowledge. Perhaps include a self-segmentation option every few months. Luckily, people love feeling like they’re progressing. Let users choose how often they’ll hear from you. If customers only want emails when you launch new products, they’re more likely to open the emails and less likely to unsubscribe from irrelevant campaigns. Clothing firm Bonobos even turned their unsubscribe option into a preferences form. Subscribers can change the frequency of the emails they receive instead of unsubscribing. You may need to use manual segmentation for other users. Do you run an affiliate program? Set up a segment just for your affiliates. You can send them swipe copy to help them promote your product. And what do you do about referrals? Set up a segment of those users who refer new business to you. You can send all of your best stuff to them because they send you new customers. Keep a segment of engaged subscribers and give them exclusive content. Tag those who respond to surveys since they’re more likely to provide feedback again. Use the open rate to determine the subscribers who enjoy hearing from you. Or create a segment for users who sign up for a range of lead magnets. If you operate a member-only portion of your site, have a segment for those members. Send them email reminders before their membership expires. Or send exclusive content just for them. Writer Mark Manson offers a membership option, sending members extra articles and granting access to his courses. Rewarding those who support you is a great way to keep those customers in the red. Do you host webinars or online events? Create a segment of attendees. Send them content related to the webinar. You can even make a super segment of the people who stayed until the end. They’ve proven they’re interested so reward them. Remember the cold/hot spectrum we discussed earlier? That represents your sales funnel. It’s also the infamous stages of customer awareness. Your subscriber might sign up for your awesome lead magnet because they’re looking to solve a problem. They’re at the cold end of your spectrum because they’re problem aware — but not ready to buy. Through your emails, or just more exposure to your products, your subscriber moves to being solution aware–they know how to solve their problem. Now you need to educate them as to why they need to buy from you, to move them to the hot end of the spectrum. Moving subscribers from new sign ups to paying customers is the journey from acquisition to retention. It costs less to retain a customer than it does to gain one. Using email automation and segmentation, send a series of emails to new sign ups to help them get to know you. Direct them to your best offers or content. Give them plenty of value so they’re more likely to buy when they get up to speed. Pulling together this information can be really tricky, and it simply doesn’t fit into a normal email ‘list’. Websand lets you see how much a customer has spent during their relationship with your company. This gives you the right format of data, so you can segment subscribers according to customer value. It’s much easier to send the right content when you know where in the spectrum a customer is. Get your plan together. What segments would really help you improve your marketing. Dig around in your data to see what segments make sense for your business. Plan the content you’ll send to each segment. Consider what trigger you need (if any) for them to receive it. Create your content, link it to the segments, and get on with being amazing! If you need help setting up segmentation or need an email provider that’s built around segmentation, get in touch. We’re standing by to help!